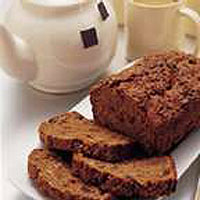 A popular tea time favourite that can be stored in the freezer until needed. Choose ripe bananas as they are easier to mash. Grease and line the base of a 900g loaf tin. Place the bananas in a large mixing bowl and mash until well mixed. Add the remaining ingredients, except the demerara sugar, and beat until well mixed. Transfer to the prepared tin and level the surface. Sprinkle the demerara sugar on top. Bake in a preheated oven 180°C, gas mark 4 for 50-60 minutes or until golden and cooked through. If necessary, cover after about 40 minutes to prevent the top from burning. Cool in the tin for 10 minutes before transferring to a cooling rack. Serve cold, cut into slices. This recipe is suitable for home freezing. Allow the tea bread to cool completely. Wrap well and freeze. Thaw for about 4 hours at cool room temperature before serving. To make Chocolate and Banana Muffins, follow the recipe above omitting the cinnamon and sultanas. Replace with 100g bag Supercook Real Plain Chocolate Chips and an extra 25g Waitrose Light Brown Muscovado Sugar. Spoon into 9 paper muffin cases and bake at 180°C, gas mark 4 for 20-25 minutes or until risen and golden. Serve warm or cold.